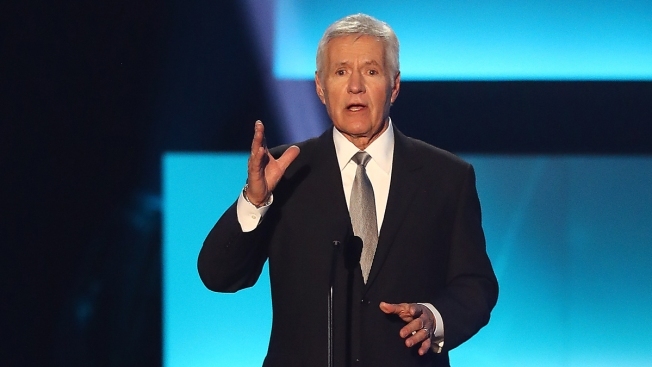 Television personality Alex Trebek speaks on stage during the NHL 100 presented by GEICO Show as part of the 2017 NHL All-Star Weekend at the Microsoft Theater on Jan. 27, 2017 in Los Angeles, California. We'll take "Things That Have Never, Ever Happened on Jeopardy" for $1000, Alex. On the Thursday, March 1, episode of the iconic quiz show, history was made when, during the final round of Jeopardy, two contestants found themselves in a tie. After all three competitors wrote down the wrong response to the prompt "Once known as the Norman Isles, per the British govt. this group is 'not part of the U.K.' and has 'never been colonies,'" (the correct reply was Channel Islands), returning champion Laura and challenger Sarah were both left with $6,799. As everyone reacted in the exact amount of delighted shock at the results, host Alex Trebeck went about explaining that it was time for the show's first-ever sudden death tiebreaker. In 2016, the show announced tiebreaker rules on its website, explaining: "If there are two or three players tied for first place after each contestant unveils their Final Jeopardy! response, Alex will present one more category and read the clue. The clue has no dollar value and does not increase the player's winnings." The first contestant to buzz in with the correct answer would be declared the winner. If neither were able to come up with the correct answer, the round would continue going until someone eventually could. We won't spoil the outcome of the historic moment in TV for you here. To see how this one shook out, be sure to watch it all go down in this video.